කැනඩාව උතුරු ප්‍රදේශය ඇමරිකාවෙන්ද , නැගෙනහිර දෙසින් අත්ලාන්තක් සාගරයෙන්ද සිට බටහිරින් ශාන්තිකර සාගරය සහ උතුරු දෙසට ආක්ටික් සමුද්‍රය අතර තම දේශය ගොඩනගා ඇත. එහි මුළු වර්ග ප්‍රමාණය අනුව බලන කළ ලොව පිහිටි දෙවන රටයි. ඇමෙරිකාවේ දකුණු හා වයඹට ඇති පොදු කැනඩා දේශසිමාව ලෝකයේ ඇති දිර්ඝතම එකය. කැනඩාව වාසනාව පිණිස බොහෝ ආදිවාසික ජනයා වාසභූමි කරගත්හ. 15 වැනි ශතවර්ෂය ආරම්භයේ බ්‍රිතාන්‍ය හා ප්‍රංශ ගවේෂකයින් අත්ලාන්තයන් තීරය මත පදිංචි වුහ. ප්‍රංශය තම උතුරු ඇමෙරිකානූ ජනපදය ගිවිසුමකින් තෝරා පැවරූ අතර ප්‍රදේශිකයන් 4 කින් යුත් ඒකාබද්ධ රාජ්‍යයන් ලෙස බිහිවිය. මෙය ප්‍රදේශ වැඩිවීම හා ස්වරාජ්‍ය බවට බ්‍රිතාන්‍ය රාජධානියෙන් වෙන්ව පැවත්වීමට ඉවහල් විය. මෙම ස්වරාජ්‍යය ව්‍යාප්තකරණය 1931 වෙස්මිනිස්ටර් ව්‍යවස්ථාවෙන් සහ 1982 කැනඩා පනතෙන් ස්ථාපන කරන ලදී. බ්‍රිතාන්‍ය පාර්ලිමෙන්තුව මත නීතයානුකූල සලකුණු උග්‍රවිය. ↑ Department of Canadian Heritage. "Royal anthem 'God Save The Queen'". Queen's Printer. සම්ප්‍රවේශය May 23, 2011. ↑ Kallmann, Helmut. Marsh, James Harley, ed. "National and royal anthems". Encyclopedia of Music in Canada. Historica-Dominion. සම්ප්‍රවේශය May 23, 2011. ↑ Official Languages Act. 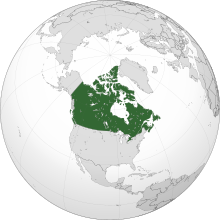 Government of the Northwest Territories. 2004. පි. 4. Archived from the original on August 9, 2011. http://web.archive.org/web/20110809180703/http://www.nwtlanguagescommissioner.ca/pdf/Official_Languages_act.pdf. Retrieved November 27, 2012. ↑ "2011 Census: Population and dwelling counts". Statistics Canada. February 8, 2012. සම්ප්‍රවේශය February 8, 2012. ↑ 6.0 6.1 6.2 6.3 "Canada". International Monetary Fund. සම්ප්‍රවේශය January 3, 2013. ↑ "Distribution of family income – Gini index". World Factbook. CIA. සම්ප්‍රවේශය September 1, 2009. ↑ "Human Development Report 2011" (PDF). United Nations. සම්ප්‍රවේශය November 2, 2011. මේ පිටුව අන්තිමට සැකසුවේ 29 මාර්තු 2016 දින දී, 11:22 වේලාවෙහිදීය.